The business → synergies approach is concerned with discovering possibilities for adding value to the organization, not with finding solutions within given constraints. This approach uses a framework for thinking about projects based on business concepts such as increasing economic value, or Economic Value Added (EVA). The use of economic value as a decision criterion indicates a change in the way project success is determined and points the way toward the future of project management. While the old criteria of meeting outcome, cost, and schedule constraints will still be important factors for measuring the project progress, they are augmented by business factors that are used to measure project success. The → entrepreneurial approach to project management requires you to manage the project as if it were an independent business venture. But you must also manage with the larger organizational system in mind. You need to understand how the elements of the project affect the business as a whole and how elements of the business influence the project. This dynamic new approach to projects will serve you well whether your project is in a business, a non-profit organization, or a governmental agency. Business Orientation – concentrates on the entire life of both the project and the project outcome, from birth to death. Contains marketing risk: the probability that the company can sell the outcome. Technical Orientation – concentrates on the project itself, which produces the outcome within given time and budget constraints. Contains technical risk: the probability that the project team can actually produce the desired result. 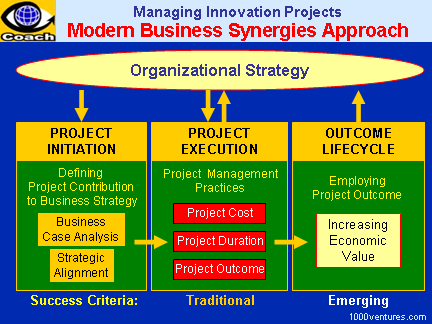 What is Business Synergies Approach? The systemic business synergies entrepreneurial approach is concerned with discovering possibilities for adding value to the organization, not with finding solutions within given constraints. Though this approach is built on the old triple constraints of project management – cost, duration, and outcome, – it goes beyond these constraints to consider factors for developing business results. Change in the marketplace that is accelerating and occurs at increasingly random patterns today, increases the market risk and the necessity of having project managers make important decisions at the project level during its implementation. Constraints imposed earlier may become obsolete very fast, and there is no time to constantly check in with upper management before acting to keep up with changing conditions. Business Administration – focuses on finding solutions within given constraints (output, time, and budget); characterized by an early design freeze that creates a stable target for the project; effective when duration of the project - or the time required to innovate - is shorter than the rate of change in the business environment. Managing innovation requires specific business systems approaches. Entrepreneurial management is fundamentally different from corporate management that is focused on delivering the annual operating plan. You need to consider your project and your project outcome lifecycle in a wider context of the overall organizational strategy. Unlike traditional project manager who has to meet static constraints of project deadlines, budget, and outcome, you should act as an entrepreneur and deal with a dynamic business system. You should be able to manage for broader economic and financial gain for the project and project outcome lifecycle, thereby contributing increased shareholder value to your company. To achieve that goal, you would require to have a broader understanding of the whole business and the way your project supports the overall strategy and fits into the dynamics of the business system. You should also be prepared to fine-tune the project budget and the project as a whole in response to market changes and competitor actions in order to react timely to arising problems and emerging opportunities. Entrepreneurial approach to project management that understands the dynamics of the marketplace and competition may require radical change in the project success measurement and control systems of most organizations. Business-oriented controls should focus on market performance, timing and investing for higher return rather than on meeting fixed specifications and constraints. They must resist the temptation to use operating-plan logic to manage new ventures. The parent organization should treat the project as and internal start-up or a spinout that, in a competitive environment, develops an outcome that supports the overall organizational strategy and, in particular, the corporate venture strategies, and contributes to its competitive sustainable advantage. Organizations should provide an enabling environment to empower the project manager to act as a CEO and thus to contribute his best to the corporate strategy. Apart from providing the necessary funding, the organization should shield the project manager from organizational restrictions, reward results, and exercise minimal control. Many of these organizations will need to change their mindset, redefine their concept of organization and loose controls in order to expand their capacity for speed. They should broaden their tolerance to mistakes and encourage entrepreneurial approaches not only verbally, but by creating conditions by which you can be an entrepreneur.